If we go by the dictionary definition of sustainable, the meaning is pretty clear. When we start talking about sustainable agriculture, things get a little more complicated. SUSTAINABLE: Able to be maintained at a certain rate or level. As our culture grows more environmentally conscious, sustainability has become an ubiquitous buzzword. In the business world, sustainability means the process by which a company balances financial, social and environmental risks. In other words, it’s the ability of a business to manage their bottom line while remaining socially and environmentally responsible. In this sense, a sustainable business is one that stays in the black financially, while also balancing social and environmental priorities. When it comes to agriculture, sustainability has taken on a much narrower definition, limited by many viewpoints only to encompass environmental conservation, without considering the farmer’s need to earn a living or the need to provide an affordable, sufficient food supply. It seems sustainable agriculture has come to mean farming without leaving a footprint. Somehow, we’ve forgotten that agriculture is a business like any other—except it’s the business of feeding the world and providing for our farming families and communities. Farming is also a vital component of our state and national economies. Agricultural production based solely on environmental conservation could not be economically or culturally sustainable. For those of us who live life far removed from working the land, it’s easy to evaluate farming practices through a narrow lens and to define sustainable agriculture using a narrow definition. Urban-centric perceptions hold that our farming families and communities pursue food production without regard for water, land and wildlife. This leads to prioritization of environmental initiatives and regulations without consideration for the economic and cultural contributions farming makes to our state and nation—and without acknowledging our famers’ dedication to preserving the land that sustains them. Farmers are actually the greatest stewards of our fertile lands. So, let’s take a look at what it really means to farm sustainably. The key to sustaining a sufficient food supply is efficient use of available productive land. Organic farming is less productive for most crops. To sustain current food production levels using only organic farming methods would require farming 1.8 times as much as all urban land in the United States. Think about it like this. One acre is about the size of a football field. Growing all U.S. crops organically in 2014 would have required 9 million more acres of land—the rough equivalent of nine million football fields, or all the parkland and wildland areas in the lower 48 states. Clearly, this type of land use could not be sustained—especially since we’ll have to grow 70% more food to feed the world’s growing population by 2050. Farmers work hard to incorporate technology and scientific advances to feed our population as affordably as possible. And we Americans benefit, spending less of our income on food than anyone one the world. We spend only 10% of our disposable income to feed our families. Not everyone in the U.S. can afford the premium prices demanded by shopping organic. One out of six households with children in the U.S. are food insecure, meaning they can’t afford sufficient food for their families. Thanks to efficient food production, rates of food insecurity have fallen from a 2008 high to 12.3% of our population. Efficient farming methods to provide an affordable food supply are vital to continuing to fight food insecurity. One of the ways farmers do this is through precision farming methods, allowing farmers to use GPS steering for application of inputs such as fertilizers and herbicides ensuring application within an inch of overlap. This dramatically reduces the amount of inputs sprayed on a crop. Frankly, farmers want to spray less. It’s better for their bottom line. In 2015, $136.7 billion of American agricultural products were exported worldwide. Together with food processing and related industries, agricultural production contributed $992 billion to our economy. In Washington state, farming alone contributes more than $10 billion to our economy. When you consider food processing, that number climbs to $51 billion. Agricultural products account for 11% of U.S. exports, making ag a vital component of U.S. international trade. Since 99% of our 2.1 million U.S. farms are family owned and operated, farm income sustains households across our nation. 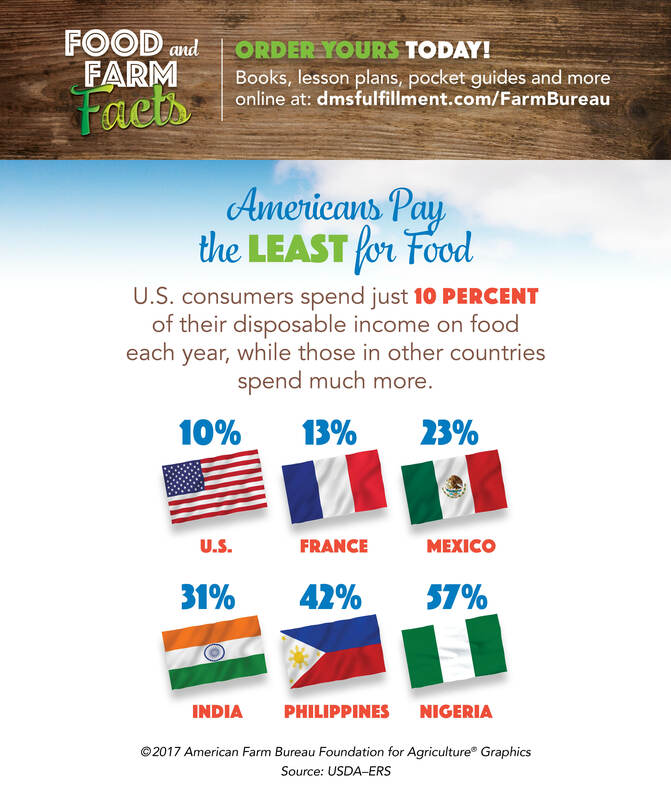 More than 89% of agricultural products sold are produced on family farms and ranches. Average U.S. farmers earn a median salary of $70,000 a year. It’s not just farmers who count on agriculture for their livelihood. Especially in rural communities, agriculture sustains families. In Washington alone, 160,000 jobs are tied to agriculture, with another 34,000 people working in nearly 1,000 food processing facilities around the state. Nationally, 21.4 million jobs are tied to agriculture and related industries. Farming and living life connected to the land are cornerstones of rural cultures. When farms fail, our farming communities lose. Contrary to popular belief, our farmers are the greatest stewards of our fertile lands. According to the National Association of Wheat Growers, “Farmers’ livelihoods, their ability to feed a growing population and the legacy they pass on to their children all depend on taking care of the land and using natural resources wisely.” Farming is a business, but it’s also the heritage farmers pass on those who will farm behind them. Every decision our farmers make balances the need to produce an abundant, quality crop with their priority to preserve the land and resources that sustain them and their families. Thankfully, science and technology make that easier today than ever before. Today’s farmers grow 262% more food using 2% fewer inputs (such as pesticides) than farmers did in 1950. Farmers also prioritize conserving natural resources, such as water, using precisely as much as crops need. Overwatering is as detrimental to crops as under watering. The same goes for applying inputs such as pesticides and fertilizer. They test and analyze nutrients in soil before applying precisely what crops depend on to thrive. Advanced farming practices have also allowed farmers to conserve soil. American farming practices have resulted in a 44% decline in soil erosion since 1982. To truly have a sustainable food production system, we must not forget to consider the business of farming and the social and cultural contributions farming makes to our communities. We can prioritize environmental stewardship while respecting the business and culture of farming. Did You Know? Herbicides can aid soil conservation. The use of herbicides reduces the need for tilling, preventing soil erosion and water loss. Did You Know? Yakima County has the most organic farms of any county in Washington? Fiction: Organic farming means grown without pesticides. Fact: The USDA approves a lengthy list of pesticides for organic farming. Take a look here.